CAST IN 1781 in Salisbury CT, This Eighteen Pound Cannon at Stonington CT repulsed a 600 British Marine invasion force on 08-10-1814, Saved by the Citizens of Stonington in 1826, from government salvage, and thus memorialized, they have been at the center of THE GLORIOUS TENTH: Stonington's Own Holiday and are identical to the Fort Washington Cannon. Fort Washington- Artillery Pieces -- CAST Circa 1781 during the Revolution War, 220 + years old Cambridge. 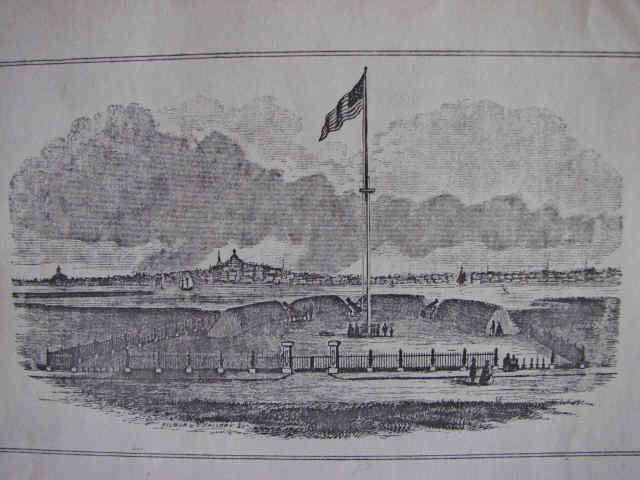 FORT WASHINGTON, 95 Waverly St., November 1775. built by Volunteer Soldiers of the American Revolution by ORDER OF GEORGE WASHINGTON in November 1775. In a letter to Joseph Reed-November 1775, GEORGE WASHINGTON stated "I have caused TWO Three Gun Half Moon Batteries to be thrown up for occasional use," The Second Three Gun Half Moon Battery is obliterated along with all other extensive Siege Works constructed by the British and American Armies during the Siege of Boston – April 19, 1775 to March 17, 1776. FORT WASHINGTON is the OLDEST surviving Revolutionary fortification from the Revolution, built by American Soldiers, and the only surviving Revolutionary fortification from the Siege of Boston. Acquired by city and restored in 1857, at which time 3 18-lb. cannons from Fort Warren (see also Fort Warren, MA) were installed, and an elaborate granite and iron fence was designed by architect John R. Hall. Municipal: HABS. The site was added to the National Historic Register in 1973. 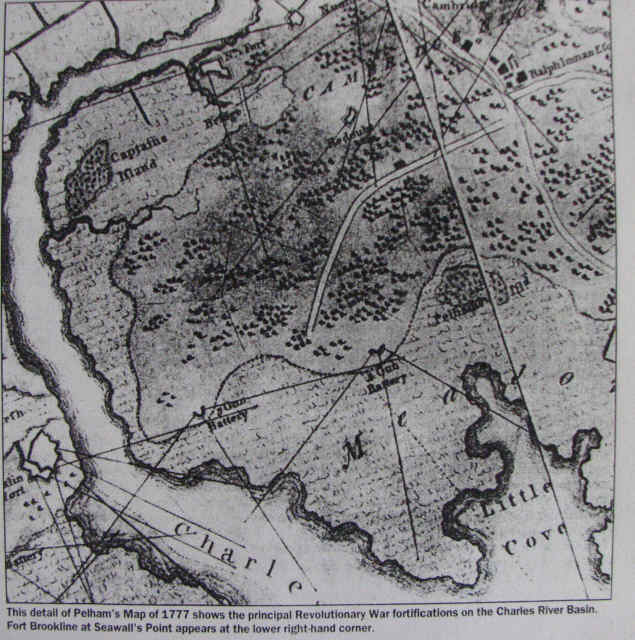 The Three Gun Half Moon Batteries” and other minor works are shown on the excellent map of Henry Pelham, made for the British in 1775 and 1776, and may well have been assumed by them as of much greater importance than was actually the case. At the time these little fortifications were constructed Knox was on his way to Ticonderoga, to get the best of the cannon which were there and at Crown Point, and it was essential that the troops be trained in constructing works in which the guns could be mounted promptly when they were received. The three gun battery at the foot of Allston Street retains the semblance of a fort, and is called Fort Washington. The land where this battery was thrown up had been held in common from the close of the Revolution till 1857, when it was deeded to the city by the following persons: Edmund T. and Elizabeth Hastings, Mary E. Dana, Joseph A. and Penelope Willard, John and Hannah B. Bartlett. A fund of $800 was also turned over to the city, by these people who cared for this plot of historic land. The conditions named in the deed were as follows: "that the above premises when suitably enclosed and adorned by said city, shall forever remain open for light, air, and adornment, for the convenience and accommodation of the owners of estates in said Pine Grove, and of the Public generally." 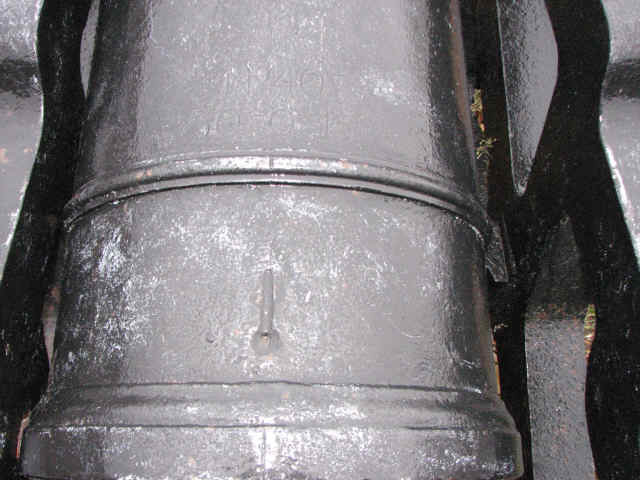 THE GUNS standing in the embrasures are 18-pounders and Cast during the Revolution. They are of the SAME cast as the TWO 18-pounders at Stonington CT, that repulsed a British Invasion force on August 10, 1814. The TWO 18-pound Cannon at Stonington CT were Cast in 1781 in Salisbury CT during the Revolution. 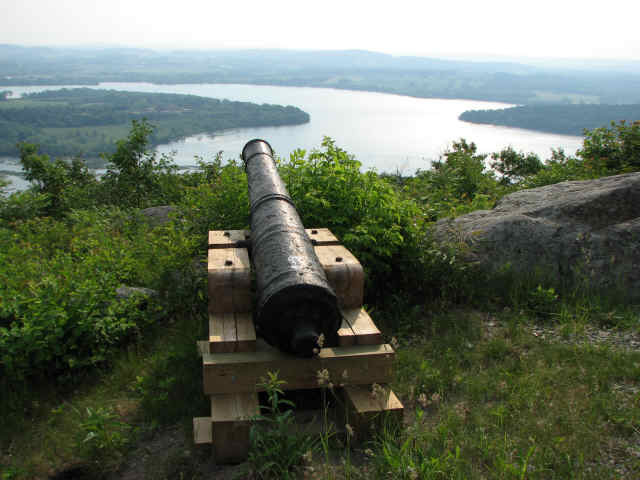 There are also Two 18-pound Cannon at Mt Defiance in Ticonderoga NY which are also from the Revolution and also of the Same CAST. The Three 18-pounders were among those over-age cannon which were removed from the original Fort Warren, on Governor's Island, when a new Fort Warren was built on George's Island. Mr. Marcus Morton, of Cambridge, learned by correspondence with the Historical Section of the Chief of Ordnance in Washington, in 1942, that the guns Carriages were cast by the West Point Foundry, on Hudson River, only the carriages) and he discovered in the city records that it cost the city the sum of $13.50 to bring these guns from Governor's Island to Cambridge! Of course guns of this size would never have been placed by Washington at this insignificant earthwork, even if the Americans had had enough large cannon. These particular guns are, therefore, out of place in any such work as this little "half-moon battery”, but as they have now been there for some 150 years and as they were presumably given, to the city with the understanding that they were to be kept there, it would be inappropriate to remove them. Besides, smaller pieces would probably have been "borrowed" from such an open space long before this time. These 18-pound Cannon, Cast during the later part (1781) of the Revolution, are a testament to the art, will and ingenuity of the American Iron Industry which manufactured these weapons in that Freedom and Liberty be realized! 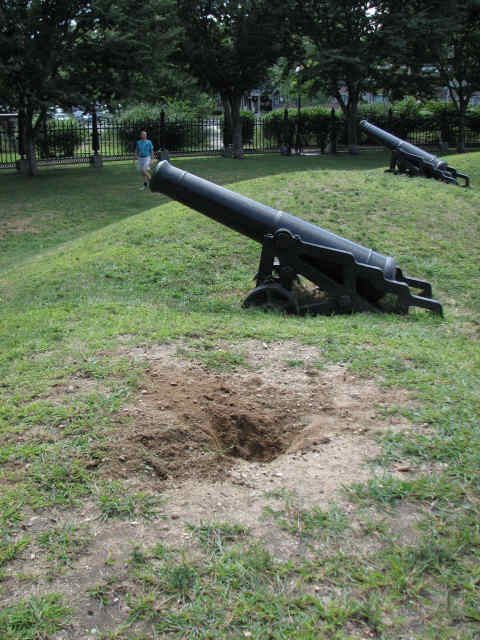 Fort Washington's Three 18-pounders at are in good condition. Markings are as follows: No 36, 30-0-17; No 40, 30-0-16; No 45, 30-0-13. At Present, knowing the TWO 18-pounders at Stonington, CT were Cast in 1781 in Salisbury CT during the Revolution, and since Fort Washington's Three 18-pounders are of same cast, conclude these Cannon were also cast in 1781 in Salisbury CT during the Revolution. 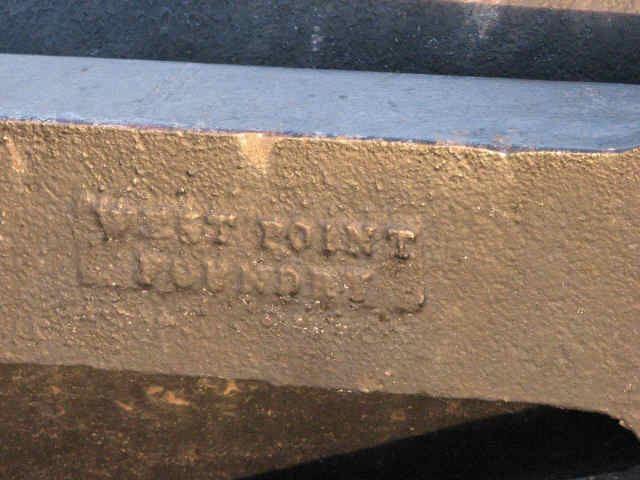 All mounted on iron seacoast top carriages - Forged @ West Point Armory in Cold Spring, New York - http://en.wikipedia.org/wiki/West_Point_Foundry . The Iron seacoast top carriages probably date from the War of 1812 and came from Fort Independence in Boston. As the 18 pounders were an old design which would have been at the Old Fort Warren - which goes back to at least the early 1800's but they would not have been at the new Fort Warren as 18 pounders were obsolete by the 1850's. This is a subtle but important difference. Also keep in mind that even though the new Fort Warren had been built, the old Fort Warren (Fort Winthrop) was still under government control and they were probably trying to find ways to dispose of the old guns at that fort. Possibly made in late 1700's. Stonington Village - Two 18-pounder guns of 35 cwt. These two 18-pounders defended the village from bombardment by a British Squadron in August 1814. 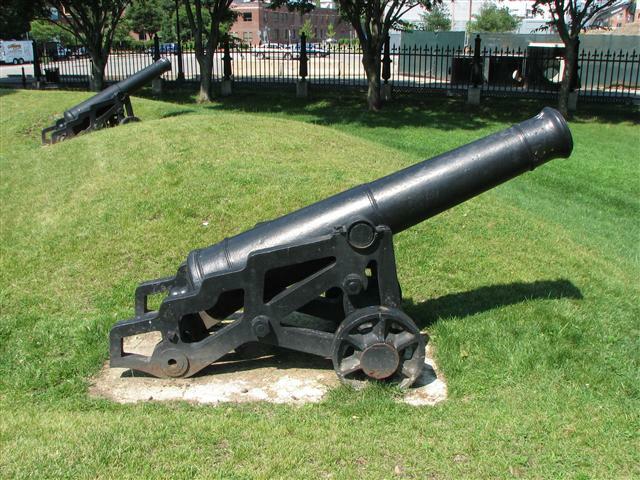 These pieces are very similar, if not identical, to the three 18-pounders in Fort Washington Park in Cambridge, Massachusetts. THE GLORIOUS TENTH: Stonington's Own Holiday. The repulse of the British at Stonington was one of the most gallant affairs of the war (of 1812), and the spirit there shown by the few who conducted the defense caused Hardy and his commanders to avoid all further attempts to capture or destroy Connecticut sea-port towns. The assailing squadron had about fifteen hundred men, while the number actually engaged in driving them away did not exceed twenty. It was computed that the British hurled no less than fifty tons of metal on to the little peninsula during the three days, (August 9th to 11th, 1814). The loss to the British was twenty lives, over fifty wounded, and the expenditure of ten thousand pounds sterling. The affair spread a feeling of joy throughout the whole country, and the result was a deep mortification of British pride. The impotence of the attack was the point of many a squib and epigram. At about six o’clock in the morning August 9th 1814, some bold volunteers came over from Mystic, among whom was the now (1867) venerable Captain Jeremiah Holmes, who had been a prisoner in a British war-ship some years before, and had learned the art of gunnery well. He and his companions made their way to the battery on the point, when Holmes took charge of the old 18-pounder. At that moment the Dispatch was making her last tack preparatory to anchoring. Holmes sighted the gun, which was double-slotted with solid round balls, and at a favorable moment gave the word to fire. Both shots struck the hull of the brig. She at once cast anchor, with springs on her cable, and opened fire with 24-pound shot. The Terror sent shells in quick succession, while Holmes and his companions kept the old iron cannon busy. These Cannon were OLD in 1814, 33 years OLD, see http://stoningtonhistory.org/index.php?id=56 THE GLORIOUS TENTH: Stonington's Own Holiday. Common Revolutionary Soldiers PATRIOTS, Who Constructed the RELIC Earthworks 02-2004, notice OPEN, pre-11-2005 Fence entrance BEFORE, Chain link dog cage and good protective turf. 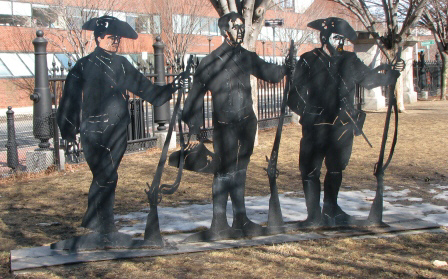 Madeleine Lord New England Patriot Statues - Commemorating the Common Patriots who built Fort Washington-11/1775. Fort Washington - 1861 -- The Earthworks were probably never this high and although eroded have been proven by Massachusetts State Archeological surveys during the 1980's to be "Fragile and Original"